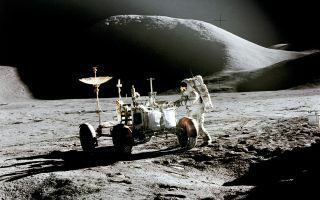 Apollo 15 astronaut Jim Irwin works in the Hadley-Apennine region of the moon during his mission in 1971. According to a national survey, the majority of Americans think that it is essential for the U.S. to remain a global leader in space exploration. The U.S. has been deeply involved in the pursuit of advancing space exploration since the early days of space travel in the mid-20th century. But, as the years have gone on, other countries and private organizations have grown considerably and become rival leaders in space exploration. The Pew Research Center conducted a national survey in the U.S. to assess how Americans felt about the country's future as a space leader. A SpaceX Falcon 9 rocket with a used first stage stands atop Space Launch Complex 40 at the Cape Canaveral Air Force Station in Florida on June 3, 2018 for launch of the SES-12 communications satellite. Liftoff is scheduled for June 4, 2018. Surprisingly, while the survey participants were largely in agreement that the U.S. should remain a leader in space, their responses were more mixed when they were asked about the importance of NASA versus private spaceflight companies. Approximately 65 percent of participants said that they believe NASA is essential to space exploration, while a significant 33 percent didn't think that NASA is necessary, and that private companies are capable of advancing space exploration all on their own. However, while many Americans are excited about the growth of private spaceflight, they are very concerned and skeptical about these companies' dedication to minimizing human-made space debris, according to the survey. Only 13 percent of those surveyed were very confident that private companies will minimize space junk, and a massive 51 percent had little to no confidence that these companies would properly address the space debris issue. Still, the survey found that those who paid more attention to space news generally had higher confidence in private space companies' ability to build satisfactory spacecraft. Ninety-five percent of participants who paid the most attention to space news had at least a fair amount of confidence that private companies would produce reliable and safe rockets and spacecraft. 62 percent think that monitoring asteroids or other objects that might collide with Earth should be a top priority. 47 percent think that conducting basic scientific research to advance knowledge and our understanding of space should be a top priority. 41 percent think that developing technologies that could be applied outside of space exploration should be a top priority. 38 percent think that conducting research on how space affects human health should be a top priority. 34 percent think that searching for materials and resources in space that we could use on Earth should be a top priority. 31 percent think that searching for life and planets that could support life should be a top priority. 25 percent said that monitoring key parts of Earth's climate should be an important but lower priority and 11 percent said it is not too important or should not be done. 45 percent think that sending astronauts to Mars is important but should be a lower priority and 37 percent think it's not too important or should not be done. 42 percent think that sending astronauts to the moon is important but should be a lower priority and 44 percent think it's not too important or should not be done. Perhaps the most surprising takeaway from this survey is that the majority of participants questioned said that they would not travel to space as tourists if they had the opportunity (58 percent would not want to go versus 42 percent who would). Twenty-eight percent of those asked thought it would be too scary; 28 percent thought it might be too expensive; and 28 percent didn't think that they would be able to make the journey, due to their health or age. The survey found that the younger demographic was more interested in the possibility of orbiting the Earth one day. Sixty-three percent of "millennials" (categorized as those born between 1981 and 1996) are either definitely or probably interested, whereas 39 percent of those from Generation X (1965 to 1980) and only 27 percent of those from the baby boomer generation or older were interested in such an adventure.